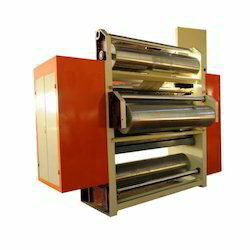 We are offering an exclusive range of Automatic Corrugation Machine. 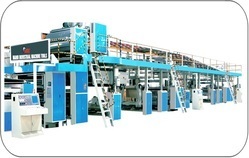 Quality-approved 3 / 5 Ply Automatic Corrugation Plant comes under this range. These products are appreciable among our valuable customers for features like high strength, better efficiency, long functionality and reliable performance. Equipped with all the latest tools & machines, the offered range is manufactured using quality raw material at our infrastructure. Besides, clients can avail these products according to their needs. For Better understanding of our customer we have given alternate names of the product also. Can adapt Section pressure or whole pressure according to the layer of the production line. which is favor of the molding of the paperboard. Up cotton belt is handled adjust the precision, the tension is hydraulic adjust. Down cotton belt has tension and left-right adjust system. The cooling and finalizing part adopt denseness and suspend type press roller design. There is skid proof rubber outside of the drive roller. Prolong the use life of the cotton belt. Automatic stack and collect cardboard. 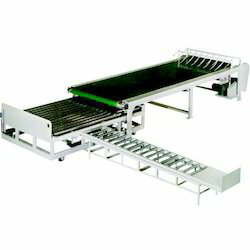 Vertical meet cardboard adopt wide conveyor belt to transmit. The sheets or height of cardboard will be moved out by switch control when reaching request. 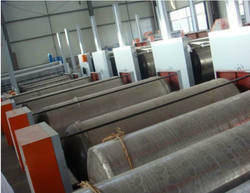 The surface of the glue roller machine is dealt with net carving and chrome plate. Pneumatic control the rise and down of the press roller. Separate frequency conversion drive is choose able. 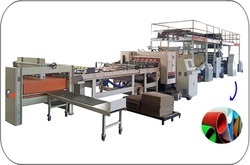 Can choose touch press system. 3. Electrical adjust the up-low, clamp-loosen, movement and center. 4. The tighten adjust adopt pneumatic or manual brake, expandable chuck. Product characteristic：The surface of the roller are trated with grinding and polishing. 5. Vaccum absorb type guide paper with wind control. 6. The glue roller are guide slippage, convenient to remove and install. 3.The surface of each rollers are dealt with grinding and chromeplated, clean and wearable. 4. Butterfly shape. 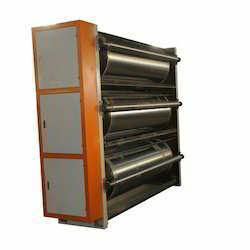 ensure the reel paper receive heat uniformly. 1. Glue roller diameter:φ219mm，The surface of the glue roller is dealt with net carving and chromeplate. 2. Pneumatic control the raise and down of the press roller. 3. Separate frequency conversion drive is choosable. 4. Can choose touch press system. 1.The surface of the hot plate is vetted. 2.The hot plate is dense type, electric control the up and down. 3.Can adopt Section pressure or whole pressure according to the layer of the production line. which is favor of the molding of the paperboard. 4.Up cotton belt is handle adjust the precision, the tension is hydraulic adjust. Down cotton belt has tension and left-right adjust system. 3.five knife eight press line. 4.Adopttunqsten steel thin blade high speed cutting. the edge unknit and lubricity. 3. Cutting scope: 500-9999mm. Cutting precision:±1mm. 4. The knife axis is small, the girth of the knife is short. average speed is high. can improve the production efficiency. 5. Drive system adopt oil pump automatic circulate lubricate. 1. Max. width of paperboard:2500mm. 2. Automatic stack and collect cardboard. 3. With electrical transmit horizontally. 12. Steam system (one set, without boiler and pipe). 5. Vaccumabsorb type guide paper with wind control. 4. Vertical meet cardboard adopt wide conveyer belt to transmit. Ours is a renowned organization, which is engaged in manufacturing and exporting a wide range of high quality Liner Preheater-Type W021/W21 2/2. These liner preheaters are designed & developed by our professionals adhering to the industry laid standards. Offered array of liner preheaters is widely acknowledged among the customers for its energy efficiency, user-friendliness and efficient functioning. Bestowed by state-of-the-art infrastructure facility, we manufacture and export superior-grade Duplex Preheater. We make use of optimum grade raw material and components to fabricate the offered range of duplex preheaters. These duplex preheaters are widely known among the clients for their trouble-free functioning, user-friendliness and longer functional life. 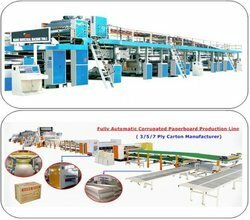 Being a customer focused organization, we are engaged in offering a wide assortment of 3 / 5 Ply Automatic Corrugation Plant. The products we are offering are made with the help of skilled and semi-skilled labors using quality raw material and advanced facilities to ensure flawlessness. Our range is known for high performance, robust construction, longer life and sturdiness. Further, patrons can avail our range as per the clients specifications.